Residents of Gunnison, Colorado, are caught up in the crossfire when two deadly extraterrestrial species bring their longstanding conflict to Earth. Responding to a distress signal, “Wolf” arrived on Earth, discovering the remains of a crashed Yautja Scout Ship and its dead crew. Accessing the Bio-Mask recording of one of his dead brethren, “Wolf” discovered the existence of the Predalien and several Facehuggers that had escaped the crash. On the one side the nearly indestructible Aliens, on the other a lone Predator whose mission is to wipe out all traces of the Alien infestation from Earth no matter who gets in the way. 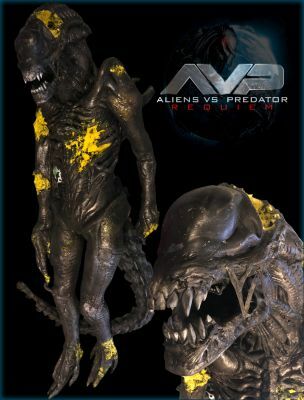 This is a complete battle damaged Xenomorph alien used in the first Alien vs Predator and then reconditioned along with changing the head for reuse in this film. The creature is articulated at every joint with an armature type skeleton that allowed him to be posed as needed for the different scenes in the film when the Aliens are being annihilated by the Predator.